In addition to providing your dog with a supporting and comfortable Smart Pet Bed -- which is practically his own little home-- another technique to improve your pet's health is with massage. Massaging helps to open blood vessels and improve blood circulation, maintaining your pet's well-being and expediting recover. Techniques can be used to reduce stress on a nervous dog or one that is anxious at times, and spending time touching your companion helps to strengthen the human-animal bond. 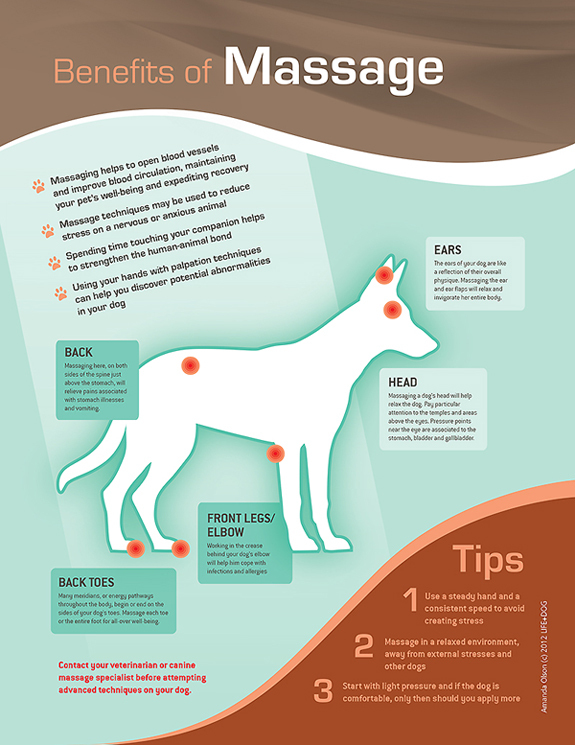 Using your hands over their entire body will also help you discover potential abnormalities in your dog that may need the attention of your veterinarian, potentially saving your dog's life. Massaging a dog's head will help relax the dog. Pay particular attention to the temples and areas above the eyes. Pressure points near the eye are associated to the stomach, bladder and gallbladder. Many meridians, or energy pathways throughout the body, begin or end on the sides of your dog's toes. Massage each toe or the entire foot for all-over well-being.